The redesign of Astor Place and Cooper Square, first unveiled in 2008, is nearly complete. The new layout greatly expands pedestrian space in an area with lots of foot traffic. While some construction work is still in progress around the subway entrance between Lafayette Street and Fourth Avenue, the rest of the sidewalk expansions are all but finished — missing only final landscaping touches. 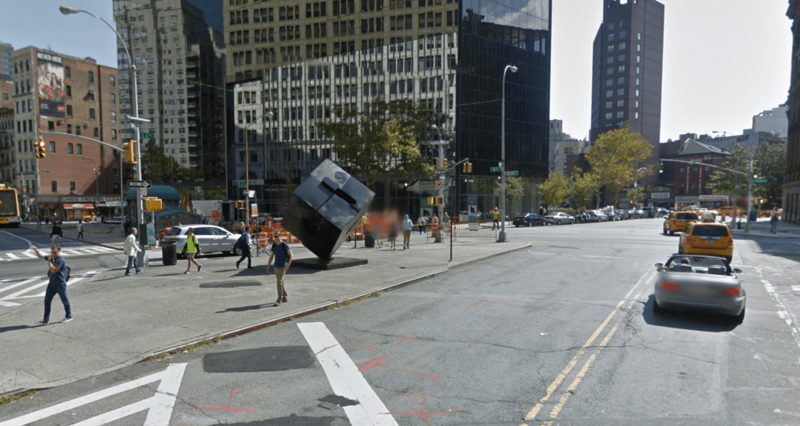 The capstone will be the reinstallation of Alamo, the sculpture famously known as “The Cube,” which previously stood on a traffic island between Astor Place and 8th Street. When it returns in August, the sculpture won’t be surrounded by traffic on all sides, instead sitting squarely in “Alamo Plaza” thanks to the pedestrianization of one block of Astor Place. South of Cooper Union, the sidewalk by Cooper Triangle is much wider and the roadbed much narrower. Outside the offices of the Village Voice there’s an expanded pedestrian zone called “Village Plaza.” Tree beds in the area await plantings, and the park in Cooper Triangle has yet to reopen. Like most capital projects built by the Department of Design and Construction, these changes have taken a long time to complete. The project was first floated in 2008. The community board voted for it in January of 2011. The groundbreaking happened two and half years later. Earlier this year, when Streetsblog inquired about the still-unfinished project, DDC said the “delays [are] due to utility interference and additional work from our client agency,” referring to NYC DOT. 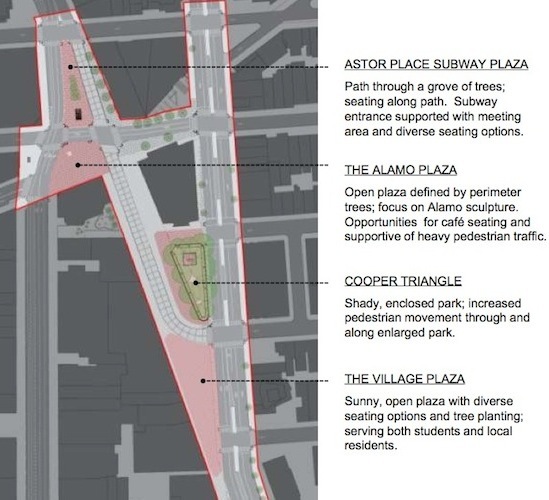 The city’s online database of projects says the Astor Place project will wrap up August 5. Just a clarification: Alamo plaza was created by pedestrianizing Astor Place, not 8th St. You can see the 8th St sign in the top picture; 8th St is still full of cars, busses, etc. thanks for catching. the post has been amended. This was a terrific upgrade to the area. However, a small’ish issue: why so few trees? 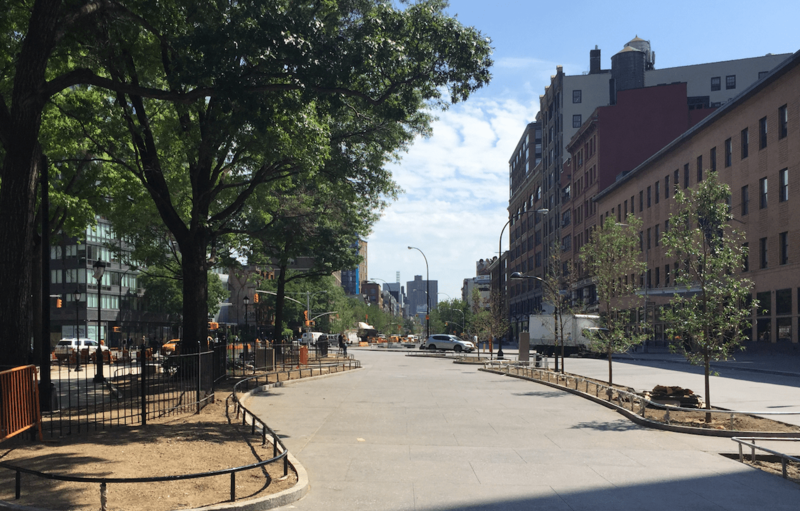 On the southern portion (near Grace School), its entirely concrete on what could have been a curbside filled with beautiful trees (the southern curbs next to Cooper Union are tree-filled now with huge tree pits – why not the same on the western side of the street?). Same for Alamo Plaza – its all concrete – why no trees? They added beautiful trees to area by the Astor subway station, but not Alamo Plaza. Again, excellent change, but this could have been truly magnificent with a lot more trees. I think because there is a very shallow subway station underneath, though I’m not sure exactly where the station footprint is. this is a fantastic improvement, but I see it as phase 1 of a 2 phase plan to fully Pedestrianize the entire space. let’s hope in 5-7 years phase 2 is completed. Awesome!! I can’t quite figure something out from the map. 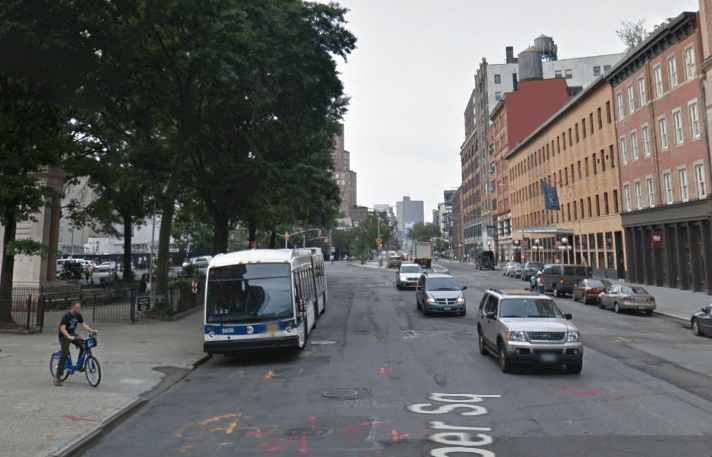 Is the diagonal street of Fourth Avenue that connects from Third Avenue & 6th Street up to 9th Street & Lafayette Street open to motor vehicles? It looks like it still is, in some way, but somehow not as much as the nearby streets / not as much as it was before? A shallow subway station would be an obviously good reason to not have trees there, but it can’t be that hard to come up with an artificial structure that could both provide shade and fit in aesthetically. It’s nice, but too bad all of the life has been sucked out of the adjacent blocks by badly thought-out development. The new buildings could have had fantastic public spaces fronting on the plaza and hosted third places such as restaurants and coffee houses, but instead they are bland towers that give nothing back to this great new space. Shows the need to think more holistically about the public-private interface. I am not the property owner – wish I was! As to the subway – perhaps that was it, but they did plant trees just a little north of where I am talking about (on the same curved curb line). Same for Astor Place – looks like they added tree pits next to the building, but not in the rest of the square. Missed an easy beautification, pollution-catching opportunity. It looks like Cooper Square West becomes a bus layover area for the M101/102. The roadway has been narrowed significantly. My personal view is that Manhattan gradually is being turned into a gigantic theme park. Everything is being “pedestrianized” for tourists and others who don’t have to make a living in the streets. This is another gradual step in that direction. Eventually, NYC will become an enclave for the rich and retired, and people who need real jobs will have to look elsewhere. Very gradual, but inexorable, process. Not a slam, not a quibble… just an observation. Not to mention, if tree roots actually are an issue, there’s an infinite of supply of alternative greenery, bushes, shrubs, grass, even trees with shallow roots, etc, that could have been used instead. The one thing is that I guess having greenery requires some amount of maintenance….